Fr Karl-Edmund Prier, a German-born Jesuit, suffered injuries to his back, head and hands. Catholics are urged not to spread panic and tensions via social media. For experts, extremist groups are preparing for upcoming elections by causing ethnic and religious polarisation. Yogyakarta (AsiaNews) – Fr Karl-Edmund Prier, a Jesuit priest and liturgical music expert, was attacked and wounded in a machete attack during Mass in St Lidwina Chapel Church in Bedog, Sleman Regency (Yogyakarta). The attack took place during today’s morning Mass. Fr Prier, who works at the Liturgical Music Centre, serves the St Lidwina community on week-ends. The church is part of Kumetiran parish, Yogyakarta. 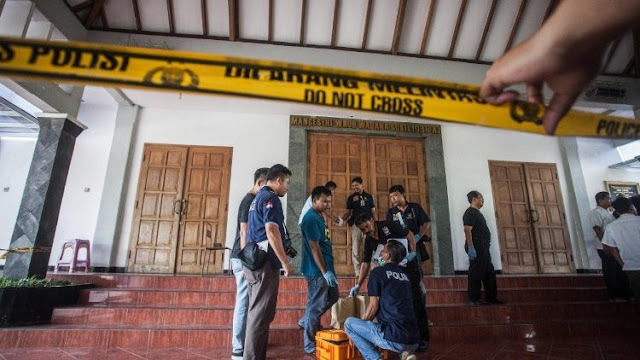 Eyewitnesses told AsiaNews that a stranger armed with a machete similar to those used by samurais entered the church compound through the front door, shouting slogans. After striking some churchgoers sitting in front of the church façade, he marched into the building where Fr Prier was starting to recite the Gloria prayer. Once at the level of the altar, the attacker began slashing at the priest with the machete. Fr Prier suffered major injuries to his back, head and hands and was taken to Panti Rapih Catholic Hospital in Yogyakarta where he underwent surgery. A soldier who lives near the church, upon hearing commotion from the building, went to see what was happening. Upon seeing the attacker, he fired a few warning shots, telling the stranger to surrender. When the latter refused, the soldier shot and killed him. So far, neither the Church nor government authorities have issued any statement. A military chaplain at the Yogyakarta Air Force Academy, Fr Yos Bintoro, issued a statement, asking on all Catholics not to spread shocking pictures and "unconfirmed information" about the incident on social media. Fr Bintoro’s statement follows a spate of social media posts with pictures of the attack and comments and explanations about it. The priest thinks that all this can only increase "bad feelings" by Christians against "other parties". According to some political analysts, extremist groups are intentionally creating this type of situations ahead of local elections in 171 regions in September 2018, and the presidential election in 2019. The aim is clear, i.e. "maintain" negative feelings so that "identity politics" based on religion and ethnicity can influence elections. For decades, Indonesian society has seen provocations that have led to acts of violence against "non-peer” groups, i.e. people who are "not like us" and who “do not belong to our group". Primordial identities based on ethnicity and religion have been the "easiest" way by which emotions, violence and conflicts can be triggered between different groups in society. Today's priest attack is the second of its kind in Indonesia. In August 2016, Fr Albertus Pandiangan, a Capuchin priest, was attacked by a stranger armed with a dagger during Mass in St Joseph Church in Medan (North Sumatera). The bishop of Medan, Mgr Anicetus B. Sinaga, also a Capuchin, and the priest later forgave the attacker.